There’s a new hate crime hoaxer making headlines. 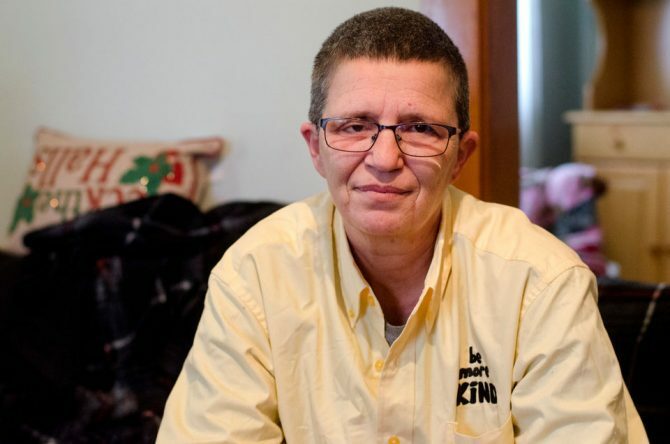 Nikki Joly is a local trans LGBTQ activist from Jackson, Michigan. He received widespread praise for organizing his town’s first gay community center and gay pride festival, as well as helping to get an ordinance passed protecting LGBTQ citizens from discrimination after a nearly 20 year battle. In 2017, the 54-year-old’s home erupted into flames. At the time, many believed the blaze was a hate crime against him. Now, police say that may not be the case. Traces of gasoline were found in five rooms inside Joly’s two-story, wood-frame home, which he shared with his partner, Chris Moore, according to the police report. Two days later, Joly urged supporters on Facebook not to respond to the fire with threats of additional violence. Joly has been charged with first-degree arson after authorities determined he intentionally set his on fire, which resulted in the deaths of two German shepherds and three cats. Two people who worked with Joly told police that he was frustrated that the Pride fest he organized didn’t generate more buzz. According to his lawyer, Joly is innocent and has been receiving death threats as a result of the accusations made against him. Joly is scheduled to appear in court on March 8. Looking at that mug is anyone surprised he is a lunatic? This comment makes YOU seem like a lunatic! He’d murder his own pets for attention? Sad and pathetic. Dumping gasoline to burn your own home and then claiming it’s a hate crime is akin to paying for people to beat you with a check. I wonder what he would have said if some person was mistakenly arrested for the fire? Would he have prevented that person from being convicted? How many hate crimes have been faked and not discovered because the perpetrators were smarter? In a way, it’s good that people are becoming aware that this type of crime is occurring–but terrible for real victims who may not even come forward now. For the better part of a year, the sentiment has been that an accusation/assumption is fact and should be treated as such with immediate judgement. I hope people are starting to realize the consequences of that childish position. The accounts of potential victims should be taken seriously but an investigation needs to happen *before* consequences are rendered to an individual or group that is suspected of being involved. I am just upset about those animals. I mean you don’t harm them in order to state your case. I am livid right now and I will stop since I can really say hateful things that would not really change anything. What you’ve expressed is well understood by many I’m sure. Both of those “people he worked with” deny making those comments. It figures…now that we have the respect that we wanted -as in legal marriage- the friggin’ ACTIVISTS find themselves without their old tried-and-true axes to grind against the system, so they are fabricating the hate. Which is sort of worse than a cry-baby actor being stupid and making up a hate crime in order to squeeze more money out of Fox; this person mentioned here was supposed to be an advocate for all of us, hopefully trustworthy and with our best interests in mind as they fight for LGBT rights nationwide. All I want to do after reading this article is to put the assh*le in a burning building with no way out, like his pets were. I’m just disgusted…. He is insane. He crime is unforgivable. His pets were innocent victims of his ugly crime. I hope life in prison awaits him and he is tortured with guilt and nightmares for the rest of his days. No forgiveness is available. Should have torched himself instead of three defenseless cats and two defenseless dogs. JFC, what is wrong with some people? Exactly how many of these fake hate crimes or fake homophobic discrimination incidents do we have to have before we can stop saying that they’re isolated incidents and have to address them as a real problem within the gay community? I mean this is definitely next level stuff, but it does seem to happen a lot more frequently than it should. Just off of the top of my head I can think of 6 of them over the past couple of years, and I’m sure there are a few more that I’m not remembering. And people wonder why others hate gays. I’m beginning to wonder if hate crimes actually exist outside of 3rd world countries. 1st word has been full of hoaxes…….. This story doesn’t report any sort of evidence indicating that he set the fire. It merely reports that gas was found sprayed around rooms of the home. OK – so that indicates it wasn’t an accidental fire, but it doesn’t mean the owner set it himself. We all may wish to wait a bit (at least until he’s proven to be guilty) before casting him out as a pariah. He was charged with first degree arson, so there must be something that made them think that he did it apart from the presence of gasoline. Which of course doesn’t mean he’s definitely guilty, but that there’s more to it than this story tells. One of my best friends had mental issues. He smashed my window in, we tried to choke each other once, but I still dream about him. I hope he is safe and well. Mental illness is nothing to snark at. If he truly has something wrong with him, our brothers and sisters should support him getting the help he needs, while mourning the animals he killed doing it. C’mon. You all know that crazy weird fag that gets drunk in the middle of the street and you protected so he didn’t go to jail. Monster. Murdered his own pets? How terrified they must have been and trusted him. Hope he hangs himself in his jail cell. Did I miss the part of the article that says the accusation has been proven to be true? If it’s true it’s hideous. Right now it’s just a charge. Hate crime hoaxes are on the rise. The far left are becoming even more extreme. Anyone that could burn their pets alive is evil. I feel sorry for the partner, Imagine his nightmares. I’m left with the impression he saw himself as a gay Moses and wasn’t having the success he thought he should have had. A confused middle-aged gay person who is looking for some national attention can be the worst living nightmare you could even encounter. I can only wonder if she foolishly took out a mortgage out on the house to finance her missions in life and saw arson as the only way to save her financial neck. I’ll bet thats what happened.